I got an inkle loom for Christmas!! Actually, I got the parts to make a loom out of PVC pipe, which made me so happy because A) it was fun to put together and B) it was cheap, cheap, cheap! 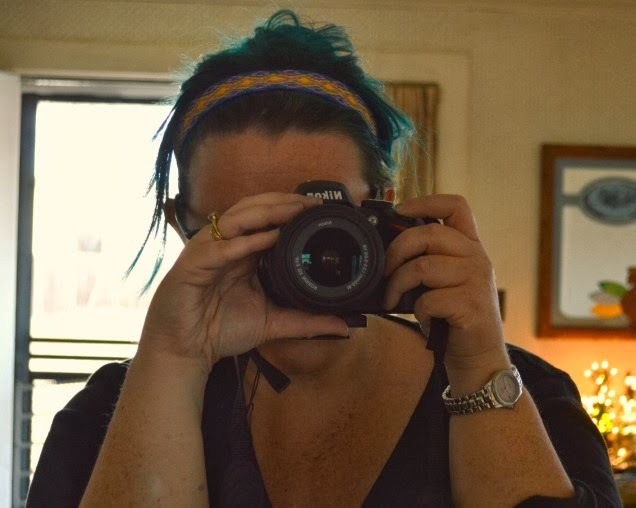 **For those of you that might not be first century weaving scholars, inkle means "ribbon" or "strap" and refers to narrow bands of warp-faced fabric that are woven on a small, portable loom. Normal weaving (to make fabric) is done on large floor looms which are not portable and can take up a lot of space. My loom makes about eight feet of finished trim. I've got a cute pink checkerboard pattern warped on it right now. I'm still new at it, so it takes me a couple of hours to get it warped, and then it will take me another couple of hours to weave it. These are some of my first bands. 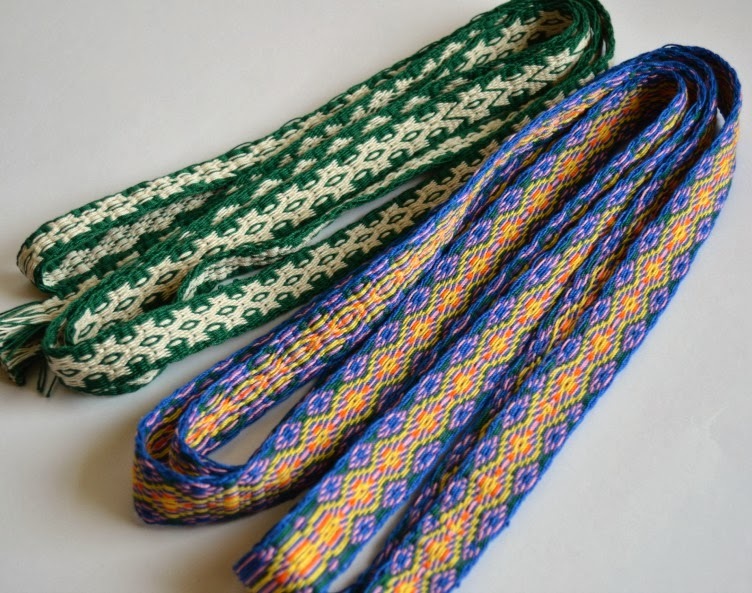 I made them with regular inkle weaving, using heddle strings to create the shed. These are my card weaving bands. I have fallen in love with card weaving! It's faster than regular weaving (for me) and the results are so beautiful. 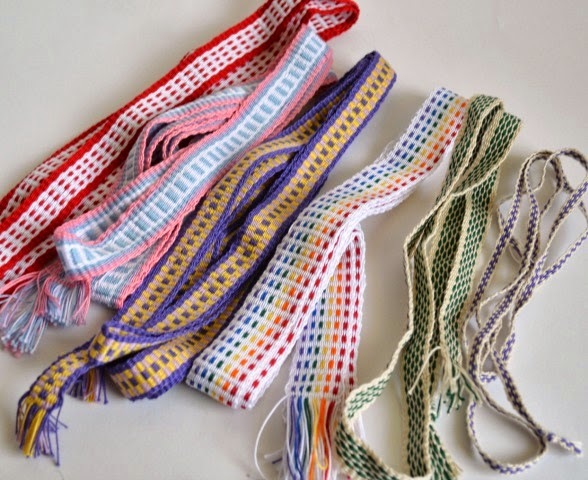 I've used some of the finished trim as drawstrings for some muslin bags that I made, and I also have made some of the woven trim into headbands. It makes great headbands! They remind me of the non-slip headbands that I used to buy, back when I was running. Did you guys get any fun new toys this holiday season?! My goodness the bands are very pretty but I am a crocheter and it felt like I was reading another language. All those terms are not familiar to me but I loved that you are so creative. Maybe you could add some definitions on your posts. I may be the only one who doesn't understand the terms. You impress me all the time with your creativity. These are soooo intricate looking!!!! Beautiful...I learned card weaving many many years ago but don't remember any results like this. Thanks for sharing. Cool! 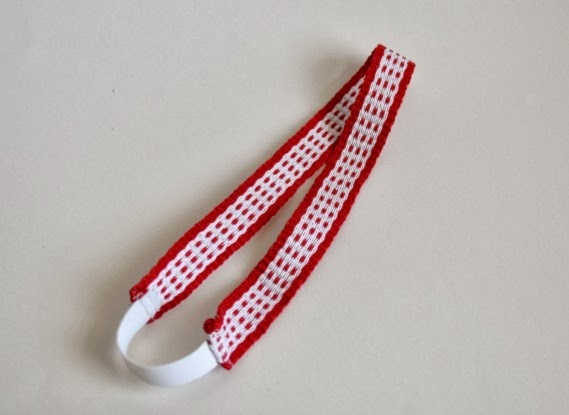 In college, we did weaving with the cards that you use with that loom, but we tied the string to a door knob. I never knew that people used looms to weave with them! I have the cards but do not know how to use them. :( Where can I go to get help on learning to use them? Hi Camille! I bought a book, by Candace Crockett, called Card Weaving that explained it really well. I had some trial and error at the beginning, but I don't think I would have figured it out without the instructions in the book. Hope this helps! Would it still be possible to get the schematics/guidelines from you? Jaime, is there a link I can order one from? I would like to know measurements/schematic and also how much it would cost to get the pre-cut pieces? I also would love specs for how to build one of these myself! this is a great design. Jaime, I can not believe I found You!! I was just trying to design this very item. Would you please share your cut measurements with me as well??? Jaime, Thank you Thank you so much! Mine is done. I am so excited to give her a whirl. Jaime, Please I am interested in purchasing the thing and putting it together myself. When you send the parts do you also send instructions? I know increasing the cost but it would be worth it to me, I think. Otherwise what would I do? Or do you still recommend buying the book. I am 70 yrs old and very arthritic and love to learn new things that I can sit and do. Bu the way still working on my Harley Davidson afghan. Trying to even out the side edges now. Found out do the afghan stitch too loose and too tight. Probably should have practiced it first.and practiced tapestry as well. But it really is coming out so nicely. The letters look just like you picture. Hi Jaime, are you still offering the schematics for the loom? I have been searching all over the place for a loom I could build myself. Thank you so much! I am also interested in the schematic of the loom. Hi Jamie! It looks like I'm not the only one who wants your loom design! It looks really nice and super portable! And your bands came out so beautiful! Your card weaving looks really good! I can't wait until I get to that level of awesome! Halo. Please, would you please share your cut measurements with me as well??? Please, please! Sorry, but my english is not so good. If you're still offering the measurements/schematics for the loom, I'd very much appreciate them! I'd be happy to exchange them for instructions for fabric and PVC shelving suitable for magazines or small books. Are you still loving your homemade loom? I've wanted to try my hand at weaving for some time now but looms are so expensive. Would you still be willing to share your design? I would love the information about the loom dimensions: I would make mine with copper pipe since I've got some but I wonder if it can handle a TIGHT tension that would be required for tapestry weaving? I want to make several small (postcard sized) pieces. 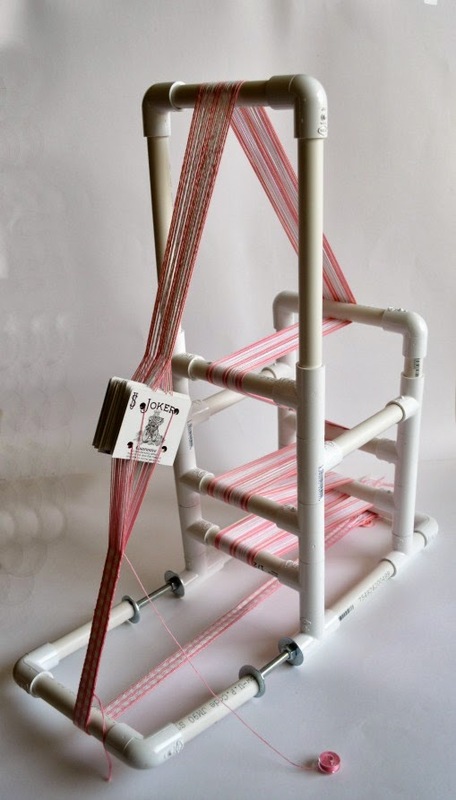 I would love it of you would share the instructions for the inkle loom. I was a weaver in college but have done inkle loom weaving since then. Thanks! I'd also be interested in you schematic/parts list, please. Yet another request for your agendas. It is an inspired design. Thank you for sharing! Do you have a schematic for you completely awesome loom? Gorgeous bands too! Just stumbled across your loom on Pinterest. Love the design. I too would like the plans / schematics. Love your loom! I made a small one out of yardsticks for beading lanyards and I'd love to make yours too. Please send the plans / materials list. Thank you so much. I also would love to know the specifications on building one of these. I am also interested in the schematic for the loom. Brilliant, lightweight and looks simple to warp up. Valkyrja'sWovenWonders@gmail.com. Thanks, I live in Dublin, Ireland, so diagram only would be appreciated. How fun that is!!! I just got a Lap Loom and I'm looking forward to using it, but this is something that intrigues me. One thing at a time!! I will be trying to get one of these together. Thanks so much for sharing!! Oh!!! so cool I would love to have your measurment! I am also very interested in the schematic for this loom! If they are inexpensive to make, this would be perfect for teaching the local 4H! I would love to get the schematic for this loom. I can paypal you for whatever the fee is! Is the measurement/schematic information still available for your PVC loom? I was also wondering how well the bolted section held up over time under tension. Since the yard changes direction to nearly vertical in the front, it would seem the bolts will start to flex upwards while trying to hold the bottom-front cross piece rung in place. I was considering making the two runners to the front rung solid pipe so they are less likely to flex upwards. The tensioning bolts would be moved to the bottom-rear rung behind the rear vertical pipe, as the tension force on that rung is essentially pulled directly towards the front, so the bolts would see almost no vertical deflection and thus remain straight over time. If the solid front runners (or any pipe sections) still bend under tension, the link below shows one method of filling the interior of the pipe with fiberglass rods to make it much more rigid with little added weight. Are you still offering to send the pieces cut and instructions for your loom? I'm very interested. If by chance you ever receive this comment, I too would like to have a schematic to build this inkle loom. I will purchase if you would like. Your loom looks amazing! I'm another new weaver that's interested in your plans and/or measurements to build this inkle loom. Still available? I'm more than willing to purchase the plans. I don't think she is checking these comments anymore. Is this still possible? I just see this for the first time and I like it very much. It is great! Soap Challenge: Smaug's Heart Taiwan Swirl!